So I like green beans. 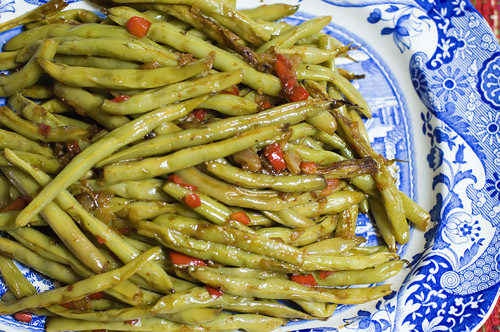 At one point in my life, I would eat a can of green beans for lunch. Just a can. Nuked. Little salt. Mmm... they were good. But not as good as these! This my friend, is yet another devine creation from The Pioneer Woman. Go. Eat. Now! Snap the stem ends of green beans. Melt bacon grease in a skillet over medium low heat. Add garlic and onions and cook for a minute. Then add green beans and cook for a minute until beans turn bright green. Add the chicken broth, chopped red pepper, salt, and black pepper. Turn heat to low and cover with a lid, leaving lid cracked to allow steam to escape. Cook for 20 to 30 minutes or until liquid evaporates and beans are fairly soft, yet still a bit crisp. You can add more chicken broth during the cooking process, but don’t be afraid to let it all cook away so the onions and peppers can caramelize.